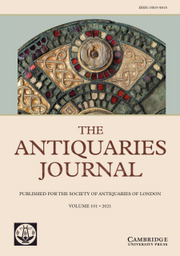 The Antiquaries Journal aims to reflect the multi-disciplinary nature of the study of material culture, publishing a balanced mix of papers from all periods, from prehistory to the recent past. The journal seeks papers that address research questions from a variety of perspectives, combining, for example, historical, art historical, architectural, linguistic, archaeological and scientific data. It will be essential reading for archaeologists, architectural and art historians and material culture specialists, as well as those involved in conservation in its broadest application.